Egyptian Chronicles: Mosireen Interviews Hazem Barakat And People Began to React Somehow "Graphic +18"
Mosireen went to Abu Muslam and interviewed citizen journalist Hazem Barakat who witnessed the horrifying massacre of Shiites last yesterday.It has not been translated yet to Arabic. It is extremely important.Hazem says that the police was there two hours before the people were killed and they did not nothing. This clip including new sad scene like how the women of village were also participating in the mob attacking cheering against the Shiites. There are more shocking and graphic clips surfacing. The villagers turned in to monsters. It is as if they were demonic creatures attacking human beings. They are even happy and do not think that they did anything wrong. Now below a video showing Hassan Shehata before his tragic death along his relatives shortly. He did not come with women like the villagers claim. Now below the video showing the attack on the same home. It is extremely graphic. 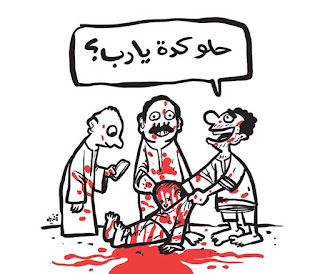 That cartoon made by Andeel summarizes the whole thing. Do You like it dear God ? 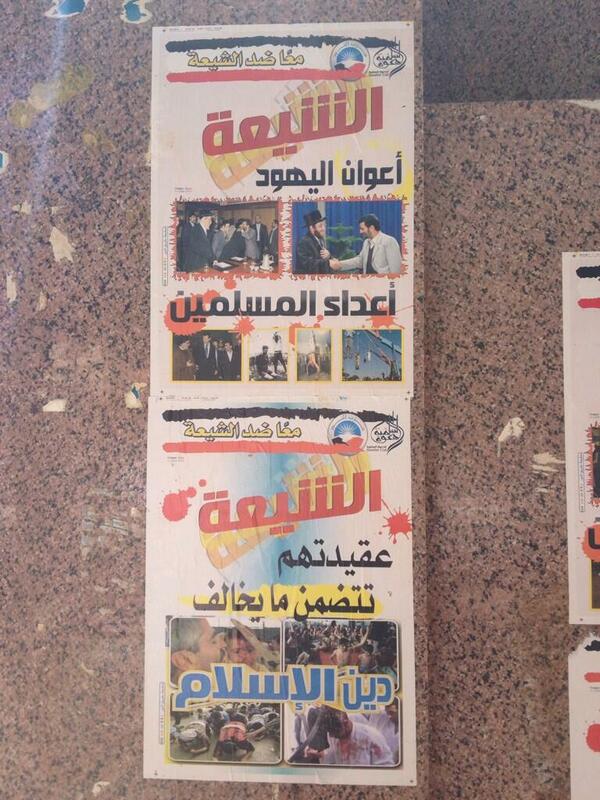 Here is a quick storify report with reactions in Egypt. 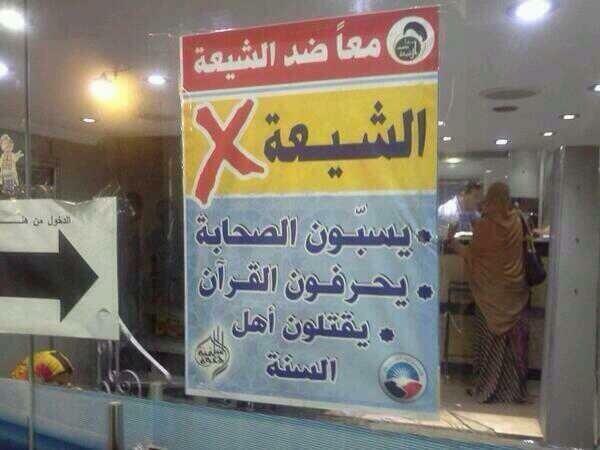 I want to say something Al Nour Party is trying to distance itself as I hinted on Storify. 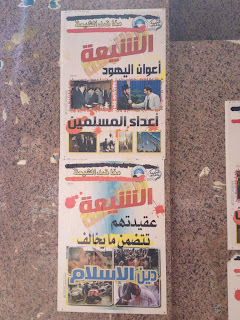 There are posters against Shia all over Egypt with the party´s logo. Zeinobia: and I'm going to be blunt: this is beyond shocking where is Morsi and where is amn al-dawla and where is the police? and what is wrong with being a Shi3a after all Allah says that he guides whom ever he wants and lead astray whom ever he wants then if the Shi3a are kuffar as we are told by el-ikhwangiyya and the stupid salafis then we can only blame Allah as he made them this way! And i do not seek guidance from the life a man who lived 1400 years ago! Can I have the URL of the facebook video showing the Shia Sheikh alive? Tragic, looks like Egyptians have turned into animals. Killing an old man that needs help and support to walk around?? RIP. Shame on the police and the legal system is Egypt and shame on Morsi and where on earth is the minster of Justice? 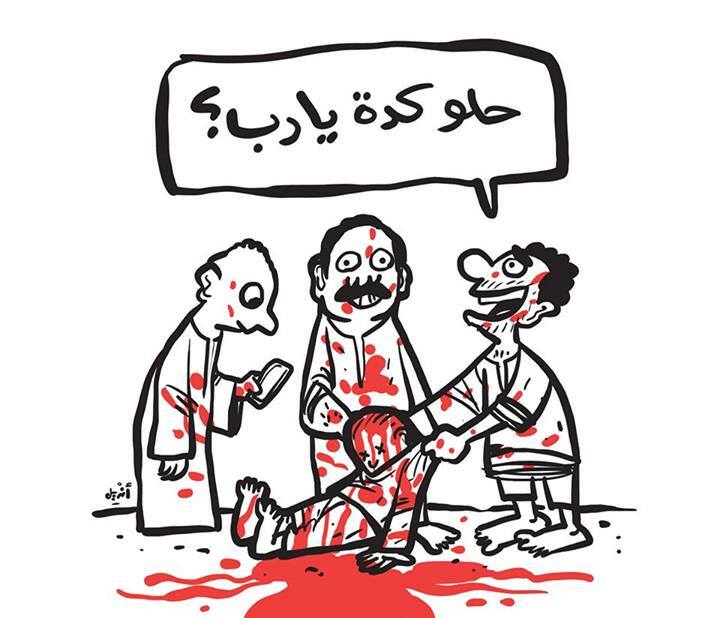 The people DIRECTLY RESPONSIBLE need to be brought to justice to show the world that Egypt does not support such senseless violence and hatred. Is Mori going to act or not? They have video and can easily identify the perpetrators and killers. He can prove he is a leader sooner then later, but he MUST act now!